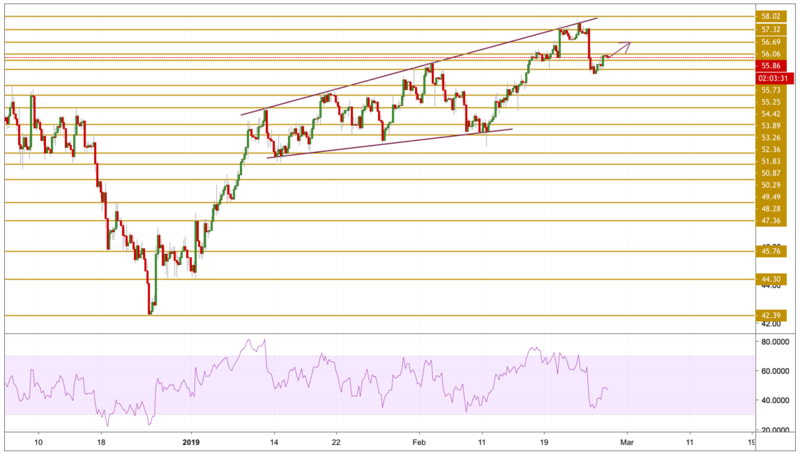 WTI Crude oil prices are back trading at $56 per barrel, having picked up a bid at a low of $55.05 yesterday, possibly due to an upbeat US inventory report. The American Petroleum Institute reported a surprise draw in crude oil inventory of 4.2 million barrels for the week ending February 22, as opposed to the consensus estimate of 2.842 million barrels. The surprise draw saved the day for bulls, as prices looked set for a deeper drop following Monday's 3 percent drop. As expected, Crude prices plunged after hitting multi-months highs to retreat towards the $55.25 support level. The price edged down following the 3% fall on Monday and printed a low of $55.05. However, the zone surrounding the $55.25 support level, provided the support for the price as it is currently trying to break above the $56 level. With Crude picking up momentum again, we can expect a further move to the upside as we will be focusing on the $56.69 resistance level.